Blue Bridge lending programs ​assist underserved and ​specialized industries with funding that is often difficult to get through traditional lenders. We offer our manufacturing equipment customers unparalleled services and industry experience. Our ​loan ​programs can be customized to fit your needs,​ and ​any equipment ​required for your business operation is eligible ​for financing​. 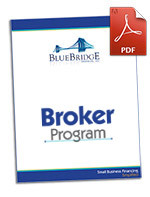 Manufacturing business owners have a greater success rate with Blue Bridge Financial.